Whenever we begin to think the MTA has pushed New York City toward an intractable transit situation, Washington DC’s WMATA makes such a load splash to remind us that it could be much, much worse. Yesterday, at around 4 p.m., news broke that, following a fire on Monday, the DC Metro had to shut down for emergency safety inspections. Due to safety concerns with the electricity deliver system that runs the subway in the nation’s capital, the DC Metro will not run at all today as crews inspect the entirety of the system’s power cables. If all goes according to plan, the Metro will reopen tomorrow at 5 a.m., but if anything is amiss, the shutdown could run longer. This is about the havoc electricity can cause when it gets loose, when it isn’t contained within power cables by tight, reliable insulation — when the juice finds a path out…Like all subway power lines, the jumper cables are heavily insulated. But if the insulation is compromised — if it wears out or is damaged — there is an excellent chance that trouble will soon follow. …Jumper cables and other power lines are attached to one another, and attached to third rails, by large, elbow-shaped connector assemblies called “boots.” In its investigation of the L’Enfant incident, the NTSB also warned that throughout the subway, “a number” of boots lacked the proper type of “sealing sleeves,” which are designed to keep contaminants away from the electrical current. Metro acknowledged that about 80 percent of its 6,400 power-cable connector assemblies lacked adequate sealing sleeves. Wiedefeld said Tuesday that about half of the faulty boots have been upgraded, but months of work on that project still remains. It’s a rather technical discussion, but you get the point: The WMATA’s power delivery system is in danger of failing, and the consequences can be disastrous for riders. So the agency is going to inspect all 600 jumper cables today and made a decision, on around eight hours’ notice, to shutter for the entirety of a busy mid-week day. Traffic isn’t moving as a combination of buses, bikes, taxis, private vehicles and a trolling 2.4 mile mixed-traffic streetcar are all trying to pick up the transportation slack, but that is nearly besides the point. The point, as regional growth advocacy groups have noted is a history of lack of support for ongoing maintenance combined with a culture that hasn’t emphasized system safety. Perhaps it’s because the WMATA is run, at various points, by two states with differing political outlooks, a barely-empowered District of Columbia and the federal government, all fighting with and against each other. Perhaps it stems from a lack of transparency and sustainable funding, as NARP alleged in a statement. Around an hour or so before the shutdown was leaked and later confirmed, David Alpert, founder of Greater Greater Washington, published his comprehensive overview of the transportation problems plaguing Washington DC. Without a balanced growth plan, more support for the WMATA and steady funding, the nation’s capital will see its subway system slide further toward unreliability. It’s a fear we’ve seen realized in New York and one that always seems on the precipice of returning. Wednesday’s outage is a reminder of how our cities rely on transit systems that do not enjoy the political support and fiscal backing these systems need to stay healthy, and I’m not sure I see a clear way forward without a massive shift in public priorities and philosophies. This is far worse than what I predict for the NYC subway in the decades to come. Here I expect entire lines to be shut down for years at a time, awaiting the funds to repair them, as all the money goes to debt and pensions, but other lines to continue running. Younger generations, who are poorer, are turning to transit. The decisions by older generations, who believe they are entitled to everything they have promised themselves but are unwilling to pay for, are taking it away from them. I wonder how a President Trump would handle this? I love transit but I would never move anywhere where my mobility depends on it. Time and time again agencies have shown that they will cut services, reroute lines, or worse, with no regard to the riders that keep the economy humming. As you pointed out, the situation is not getting better. Snow storms are the canary in the coal mine. A decade ago, as was the case for the decades prior, as blizzards would paralyze the city, transit agencies did not stop. It was their mission to keep people moving and they did it, with trains blowing through snowbanks and buses doing their best not to slide off the road. I have a lovely video in Boston from around 2005, with thundersnow overhead, over a foot on the ground, cars stuck on the road, and the green line blowing past in regular service. Then agencies started to set closing thresholds. If more than x inches reach the ground we shut down. Then that changed to planning thresholds. If more than x inches are FORECAST we shut down. Even the green line, with overhead power and a dedicated right of way – ie, perfect for snow service – gets cut when the big one threatens now. We’re paying more and getting less, year after year. It’s not sustainable, at all. WMATA was sending a message today. Government, you want your employees? Then fund us. The question is, was this enough? Larry thinks we’ll start seeing lines shut down. I think the next big trend will be completely curtailing service for maintenance. IE, the entire NYC subway closed from Sunday at 10pm to Monday at 5am for “critical maintenance”. DC, naturally, would close Sunday at 7pm for example. The result, down the line, would be the Manhattan Bridge scenario. Long term shutdowns of parts of the network. Start biking. You may have to bike to the subway, even if there is a line you can walk to. I am certainly agree Larry. I am a millennial: A 24-year-old recent college graduate who advocates for affordable and improved service for NYCT buses and subways in NYC through the Riders Alliance. I need to rely on the reduced-fare Metrocard and the monthly, welfare checks via the SSI. I will be part of the the generation that you always warned best known as “Generation Apathy” thanks to “Generation Greed;” we need to take this very seriously. Every major city across the United States has the same problem, while other countries like those in Europe and in Asia are laughing us like. So I will take this opportunity to express my major concerns to all of the commenters in this fantastic blog, especially from you Ben, whom I could tell that you are the member of the Riders Alliance Board. BTW, on 03/7/16, over two dozen people of the Riders Alliance had lobbied to Albany for the $7.3B for the MTA 2015-2019 Capital Plan without raising fares, tolls, or taxes. I noticed the same thing, but it’s not only transit that has this problem, it’s also schools too. Schools would never close unless it was nessessary. Now they close preemptively & claim it to be safety related, but the real reason is fear of being sued. I don’t think school closures are as much due to increasing fear of litigation as much as they’re related to the increasing distances between much of the school staff and the school. How many big lawsuits have schools faced over decisions to remain open during a storm? I Googled and came up with nothing. NYC citywide school closure for snow started in the 1970s. This was also not coincidentally when suburban flight was kicking into high gear. Historically, both students and teachers walked to school, so a snowstorm wasn’t a huge deal. You put on your boots and your galoshes and trudged through it, even if it was 3 feet of snow. Today, a lot of teachers live in the upper reaches of the Hudson Valley and Eastern Long Island, so they can’t make it to work in a blizzard. If the principals and superintendents and teachers live an hour away by car, they don’t want the schools open. Same with transit agencies. A lot of MTA employees live incredible distances from the city these days. The legions of MTA bus drivers who live in the Poconos can’t make it to work in a blizzard. Many years ago in Mamaroneck the school super intendant Oddie Norwood refused to close the schools under any circumstance related to snow since he was from Canada. As recently as the late 1990’s Yonkers, Mount Vernon & New Rochelle almost would never close school – even during blizzards unless ordered by police or the state. And keep in mind both Mount Vernon & Yonkers have very steep hills. Even though teachers were the usual decider to close school or not by officials, today these officials need to weigh the possibility of a bus accident & the legal blowback that would come with it. And just because it hasn’t happened yet, doesn’t mean it wont. Very true how agencies evolved to closing for snow from the RRs being the all weather alternative and carrying extra ‘snowbirds’ [and wmata being sold as such as a reason for building it]. I remember in the 1980s seeing DC Metrobuses in snow with chains. But they since decided that was too much trouble and it’s much easier to close. And in this case, it was reported the problem was in tunnels. Thus they COULD operate above ground sections [much of the system] and get people close enough to more easily get to work. But that would take some thinking and effort. Same re rerouting their buses from closed stations to desired destinations. Not to mention they could have done small critical downtown sections last night till 5 am and gotten them open today [eg Union Sta – Dupont]. But again, it’s much easier to just close, and they have a lot of experience doing that. But I disagree that funding is the problem. It’s competence. Both the Wash Times and Post have had in depth stories over the years documenting that. Just now, for example, wmata is trashing 15 year old railcars, because they have enough $ to buy new ones to replace them. We have become so hypersensitive towards almost everything including safety, it has caused reactions that are detrimental to our existence as a nation. I would say it is a little of both. You need adequate funding & the right people in charge on the governmental level as well as the agency level. Unfortunately, both are in short supply at the MTA & at WMATA & perhaps everywhere. DC’s system, despite being largely above ground outside of the city center, does not really have very much in the way of continuous above ground trackage that can be run, due to the short tunnels on otherwise above ground sections that are dotted all over the place. None of these sections except for the first two connect to each other. True, but being kind of wild and crazy, I would have taken the risk of those short segments, or at least inspected them first. Then, for example, you would have been able to get as close as National Airport and NY Ave, from which, along with Falls Church and MN Ave it is a lot easier to get downtown by other means than from the ends of the lines. But apparently these days so many people can either telecommute or just take off, it barely matters. I love transit but I would never move anywhere where my mobility depends on it. I think in practice most places where mobility really and truly depends on transit tend to have serious and reasonably competent transit operators, because it’s very hard to build or maintain such a system without them. The factors which worked to destroy competent transit agencies in many places in the U.S. also tended to destroy the transit systems themselves. I just sold a bond to fund deferred maintenance for $15 million to somebody from China. Am I supposed to dislike them?… I love China. The biggest bank in the world is from China. You know where their United States headquarters is located? In this building, in Trump Tower. Their transit systems are much smarter than our transit systems, and we can’t sustain ourselves with that. It’s like – take the New England Patriots and Tom Brady and have them play your high school football team. That’s the difference between China’s transit systems and our transit systems. How would president Trump handle it? I’d guess he would probably build a big wall between maryland and virginia. That would solve all the problems. I don’t even think there is anything that wrong with shutting down lines, particularly els, for long periods. The problem is, in the absence of a policy for system expansion, many people can’t hope for redundancy. We can expect, over the next century, that the els – some of which have components that date to the 19th century – will need to be shutdown and rehabilitated or even completely replaced. This is as much a matter of physics as it is finances. No point in lying to ourselves about it. News just came out today that parts of the M will be going through this. The prior governor of VA almost refused to pledge support to WMATA unless he put two of his cronies on the board. Larry Hogan governor of MD, canceled the purple line until he got the deal restructured to his liking. Oh, and lets not forget the mess that is the Silver Spring transit center. Silver Spring wasn’t down to the WMATA. It was Montgomery County that built it and didn’t monitor the contract closely enough plus poor construction. This is a perfect example of the issues that plague metro areas straddling state lines. We need a new concept for metro-area governance that supersedes state and smaller local governments on certain issues within their metro area. Cities should have full control over their own transit network, roads, and airports. There are ton of other issues where states have sway over cities to their detriment. Liquor laws, development funds… Cities are too often held hostage by state legislators from rural districts. It makes no sense even when a metro area is entirely in one state. But when multiple states are involved, it’s almost anarchy. People talk about DC being absorbed into Maryland. Instead, DC should start annexing their neighbors. NYC grew to the size it is today by annexing things. Time to start doing that again. Annex the Jersey coastal area (Hoboken etc). Annex lower Connecticut. People in Maryland would be ticked if they got sucked into DC and no longer had representation in Congress. Maybe that’s the point. In absorbing their neighbors, DC gets the congressional representation they ought to have anyway. What a concept. Not to mention the fact that the Constitution limits the size of the District to 10 square miles. “Ten miles square” is not 10 square miles, but a square with sides that are ten miles long. So 100 square miles. Which the district was until Alexandria and Arlington County were returned to VA in the 1840s. The concept of NYC annexing parts of NJ and CT is obviously a non-starter, and if you put it to a vote I’d assume 99% of Hoboken residents would say no, even if they were given the option. Merge western CT, NY south of the Catskills, and NJ north of the Trenton suburbs into the state of Hudson. Eastern CT gets merged with RI, Southern Jersey becomes part of Pennsylvania, and the rest of what was NY state becomes the State of Mohawk or Adirondack. I’ll add to that by noting that the overall US political structure severely hamstrings urban transit systems. The funding mechanisms in place often make it so cities need federal support for big transit investments. Of course the federal government is increasingly under the control of the GOP which is held hostage by the Tea Party who loath public transit. But because small, mostly rural, mostly conservative states like Wyoming get the same senate votes as huge states like NY and CA, they punch well above their weight in terms of political power. The same thing happens at the state level. Since states often control urban transit systems, they get punished by rural state senators. State legislators hundreds of miles away from NYC in the very rural Adirondacks and Southerntier get a significant voice in how the transit system is run and funded. Never mind the majority of the state’s population and tax base exists in the New York City metro, they still want “parity” in funding. They lambaste socialism when they think even a penny of the taxes they pay will go to someone they disapprove of, but are all too happy to insist on redistribution when it benefits them. It almost sounds like you’re talking about some sort of…Bi-State Authority. But BART in California has no jurisdiction issues, and it’s also suffering weird electrical problems. Aside from all the political issues and difficulties in managing and funding multi-jurisdictional transit organizations, what I don’t understand is why there wasn’t some warning based on periodic inspections of the power infrastructure. Either the periodic inspections were not completed or they were inadequate. In either case, management should be held accountable. There was the smoke incident at L’Enfant Plaza in January 2015 where a woman lost her life due to an arcing jumper cable and a discombobulated emergency response. Following that event, they inspected all of the jumper cables. Then, on Monday this week, there was another major arcing problem with a jumper cable – one that had been inspected and passed that inspection. That is what lead to the shutdown decision from WMATA’s new GM (who wasn’t here for the previous incident/follow-up), and the concern is just as you said: either the previous inspections didn’t actually look for the right issues, or they did and didn’t catch them. Either way, that information can’t be trusted. 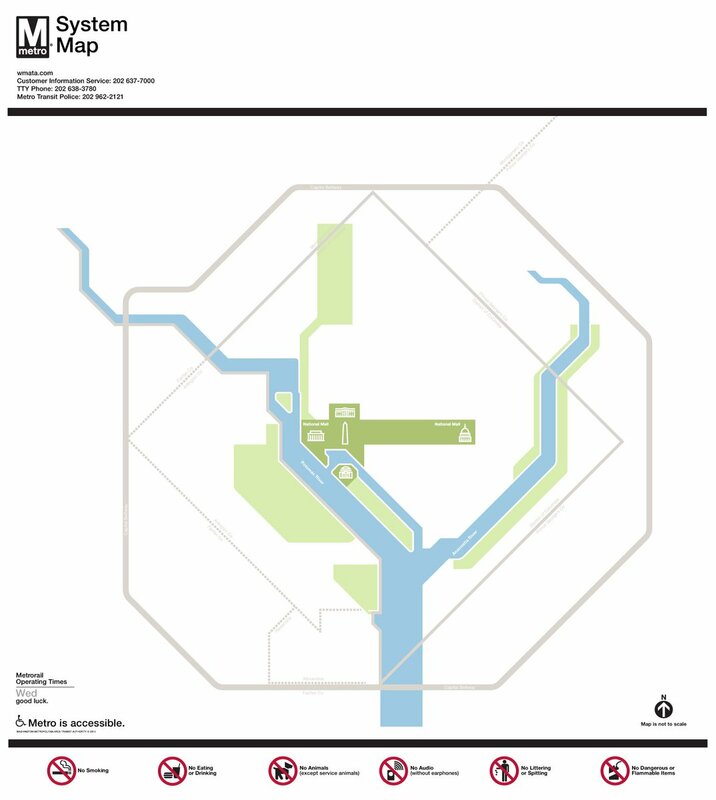 DC Metro is well-known as a patronage pit. The percentage of Metro employees who actually have the motivation and competence to do their jobs is likely extremely low, even by government standards. Think “DC public schools” level employees. Most of Washington’s system is currently between 30 and 40 years old, or roughly where New York’s subway was in the period between the mid-1930s and the mid-40s, when the first effects of aging infrastructure really started to show up (to the point that by the early 1950s, the bonds passed for the Second Avenue Subway had to be diverted to keep the existing system going). Older systems require more preventive maintenance, and D.C.’s system is now headed into middle age, no matter how futuristic the stations may still seem to be or how many escalators and elevators instead of old-style stairs they put in their system (and an over-reliance on technology that is subject to heavy usage and wear has been part of WMATA’s problem dating back 15-20 years). If the governing entities continue to fund the system as if everything’s still just out of the box, after repeated examples of how the system is breaking down, they’re just going to see the problems continue. Again, you have a transit financial crisis in Boston. In Philadelphia. In Chicago. And in New York. With politicians running away from or against the transit agencies in every case. And all this with soaring ridership! If this doesn’t make you wonder, and make you mad, and make you ask how the hell did we get here, and who made out on the deal, what will? Politicians want an immediate payback on their investment of public funds — i.e. “Will the money I’m authorizing here win me votes in my next election?” The glacial pace of subway construction and the hidden benefits of preventive maintenance on the subways make both those answers generally ‘no’, at least until the point the system’s reliability craters, as it did in the late 70s/early 80s. When a project like the SAS takes over a decade to complete, few pols are going to risk their necks to push for Phase 2, because in their minds they won’t be around to take credit for its opening, but will only be there to take blame for the construction disruptions. With WMATA, the three governmental bodies involved took the attitude years ago that it superficially looks newer than systems in New York or other cities, so why put any money into the preventive maintenance riders never see? (It’s the same reasoning, 45 years ago, that led William Ronan to solve the problem of declining maintenance on the city’s system by having the MTA paint all the cars blue-and-silver, to sucker riders into thinking they were also fixing up their working parts). I moved from Greenpoint to the Upper East Side in part to be close to(around the block from) one of the stations of the Second Avenue Subway, thinking that I’d at least have some improvement to my transit options. I wonder, though, once it opens, how long will it be before weekend or overnight ‘track work’ and ‘signal work’ (and other ‘reasons’) will start happening? Howdy, neighbor. I too live near a SAS entrance (80th st). As I walk by the unfinished utility buildings and entrances, I can’t help but think they’re going to deliver an extension with a LOT of blue plywood up to hide the stuff they haven’t finished yet. I do not see how they’ll get this all done by 12/31. 6/2017, more likely. DC Metro is not run for the benefit of commuters, most of whom are not DC voters nor a key local voting bloc. It’s run for the benefit of the employees who work on the system, most of whom are DC voters. The Metro is performing just fine from the perspective of the constituency that matters to the local governing body. 2. Only about 1,500 of WMATA’s 13,000 employees are DC residents. Right. The largest number are from PG County, MD.